Today’s look is playfully sophisticated and guaranteed to get compliments. What was the first feature that caught your eye? 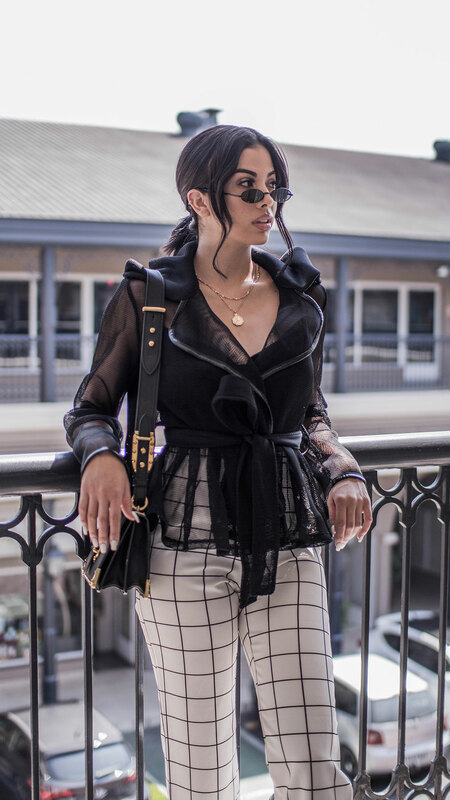 Was it this killer Fashion Nova black jacket? Or perhaps it was the plaid paints? This outfit is is so much fun! The plaid offers some light character to pair with this texture fun jacket (which is already a fun piece), and the black/ white combination leaves room to play with accessories. A neat thing about this jacket, is that it is mesh and allows the air to flow- which means you can wear this basically year round. I carried the sophistication on by adding black Zara shoes, a black Prada bag, and some sleek sunglasses. You really could take advantage of pops of color here by adding a bright bag or shoes, but as you can see the black looks stellar!